The progressive Left is fully aware of the fact that if you want to transform society during your intermittent tenures in government, then you must ensure that the education system does your work for you. One of the reasons that left-wing governments are typically far more consequential than right-wing governments is the fact that right-wing governments in Canada are often characterized by an utter lack of cultural vision combined with a cowardice that leads them to leave left-wing legislation intact once it has been passed even when they get the opportunity to repeal it. Thus, the Left simply has to effectively use the time they do have in power, and they can have a far more permanent impact on society than Canada's conservatives, who have generally ceded the culture to the Left (and thus, in time, the entire country.) When they regain power, they can more or less pick up where they left off. The NDP's Education Minister David Eggen has been hard at work on this since the day he took office, launching a two-pronged assault on Alberta's education system: Transform the curriculum of the public schools, and force the religious schools to either conform to NDP standards, or simply destroy them. 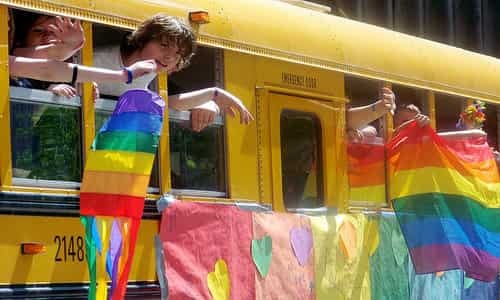 Christian schools were told that they would be forced to establish Gay Straight Alliance Clubs at the request of a single student, and that it would be illegal to tell parents if their children wanted to join it. Predictably -- and Eggen and his cronies knew this would happen -- many religious schools are unwilling to implement these changes due to the fact that these policies directly conflict with the founding principles of Judeo-Christian institutions. As religious schools desperately attempt to fight off these attacks on their identity and beliefs in the courts, Premier Rachel Notley's so-called Ministry of Education has recently revealed that the initial salvoes are just the beginning. Moving beyond issues of lifestyle and sexuality, at least 30 schools across Alberta have received correspondence from the government informing them that there is content in their "Safe and Caring" policies (which were demanded by the NDP) that must be removed. If the schools refuse to remove the offensive portions, the government could proceed with removing any funding from offending schools, or deny accreditation altogether. In short, the gun is loaded, cocked, and pointed. Even further, the NDP found the statement that "We believe men and women were created in the image of God, after his likeness, and therefore have transcendent, intrinsic worth" to be potentially "unwelcoming, uncaring, and/or disrespectful." That one is hard to figure out, but perhaps the NDP realizes that a chaotic and amoral Darwinian framework is far more susceptible to accommodating their ideological agenda than the Holy Scriptures. Don't you dare tell kids that they are made in the image of God, the Albertan government thus demands. You never know what might happen next. The NDP has laid out their position clearly. God is the enemy, and religious schools must bow the knee or face the furnace. Interestingly, David Eggen's attempts at gaslighting actually falter when you take a closer look at Canada's founding documents. When he gives interviews -- which is rare, since he is allergic to criticism and questioning -- he likes to bloviate about the duty of religious schools to follow the law, never mentioning that these were laws passed recently and specifically to target these schools. But Mr. Eggen, who finds himself so horribly offended by mentions of God, might want to read Canada's Charter of Rights and Freedoms. He has obviously never done so, and one can only imagine the convulsions that would take place at the so-called Ministry of Education if he and his reconstructionists decided to take the time. The preamble states clearly that: "Whereas Canada is founded upon principles that recognize the supremacy of God and the rule of law ... "